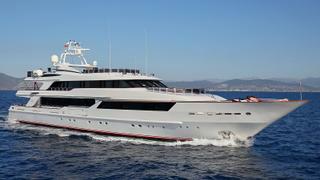 The 50 metre motor yacht FB215 has been listed for sale by Jan Jaap Minnema at Fraser. Built in steel and aluminium by Italian yard Benetti to a design by Stefano Natucci, FB215 was delivered in 1996 as the first in the yard’s Golden Bay series and had a full refit in 2016. Her interior styling was originally by Francois Zuretti and features the use of exceptional materials. The master suite is still in the original style, while during her rebuild in 2016, Adriel Design gave the rest of her interior a completely new and fresh styling. Accommodation is for up to 12 guests in six cabins consisting of a master suite and VIP suite on the main deck, while below deck are two doubles and two twins. All guest cabins have entertainment centres and en suite bathroom facilities, and six further cabins can sleep up to 11 crewmembers aboard this yacht for sale. Double glass sliding doors lead into the main saloon, boasting a white oak floor with a silk carpet, a U-shaped leather seating area and an entertainment centre featuring a large 75-inch Samsung television screen. Upstairs, the skylounge has two large sofas with two coffee tables, a card table, a high top breakfast table with four chairs, and a bar with a wine cooler and two sinks. To starboard forward is an entertainment centre including a Samsung 54-inch Smart television screen. Twin 2,226 MTU diesel engines power her to a maximum speed of 14 knots and a range of 3,500 nautical miles at 12 knots. Lying in Dubai, FB215 is asking €12,500,000.